From West (Athens, Thessaloniki etc) from Egnatia Odos Motorway (E90) follow signs to Kavala (650Km from Athens via Ethniki Odos, 152 from Thessaloniki). From Egnatia take exit 31 toward KAVALA/DRAMA and then turn right to Kavala. Stay on the main road (7is Merarchias str) until you reach the seafront. Just before the coastal road (at the traffic lights) turn left at Eleftheriou Venizelou street in which you’ll find the hotel at number 27. From East (Xanthi, Turkey etc) follow Egnatia Odos Motorway (E90) direction to Igoumenitsa, Thessaloniki, Kavala. Take the exit EO2, signed “Kavala East”. Turn right toward EO Kavalas Xanthis/EO2 and then left onto EO Kavalas Xanthis/EO2 (signs for Kavala). In the entrance of the city turn right onto Sappeon and then follow the roads Sappeon- Astiggos- Sappeon- Gallikis Dimokratias- Omonias- Dragoumi and then turn right to El. Venizelou where at the number 27 you’ll find Galaxy Hotel. From North (Drama) following the National Road Drama- Kavala enter the city and stay at the main road (7is Merarchias str) until you reach the seafront. Just before the coastal road (at the traffic lights) turn left at Eleftheriou Venizelou street in which you’ll find the hotel at number 27. From Northwest (Serres, Sofia etc). Drive towards the east exit of Serres, from Periferiaki Serron (Peripheral road of Serres) if coming from Bulgaria or from Megalou Alexandrou str if coming from Serres’ center, so to find the National Road “Ethniki Odos Serron-Dramas”. Stay onto Serron-Dramas for about 40 km and just when you pass Lefkothea village you turn right onto “Epar. Odos Neas-Mprafas Nikisianis” (there is a blue sign on the street at Lefkothea showing the direction to “Kavala/Proti”). Crossing the village Stathmos Aggistis stay on the main road “Ethniki Odos Kavalas Serron” for about 40 km. At Stavros’ village traffic lights continue straight ahead to the sharp turn at “Ethniki odos Kavalas-Dramas” and staying on it, will drive you into the city center. Stay on the main road (7is Merarchias str) until you reach the seafront. Just before the coastal road (at the traffic lights) turn left at Eleftheriou Venizelou street in which you’ll find the hotel at number 27. 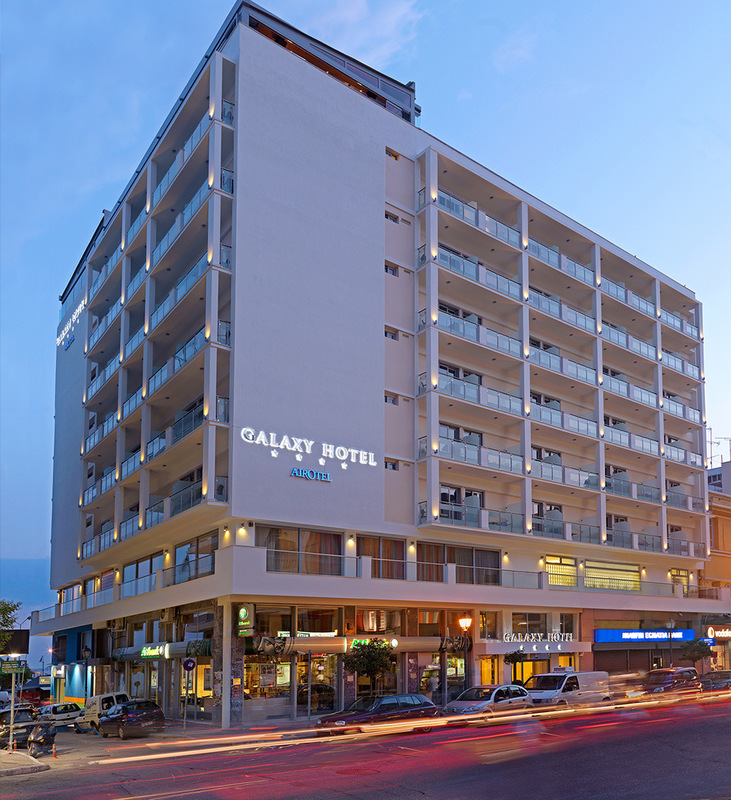 From Kavala port walk across the coast with direction to the city center and about 350 meters you’ll see the hotel. From Keramoti port you can reach Airotel Galaxy by the public bus (KTEL Kavala) which operates many daily routes, by taxi, or by car: follow the main road to “Egnatia Odos” (E90/A2) and follow the green signs (Egnatia) to Kavala. Enter Egnatia Odos and then take the EO2 exit, “Kavala East”. Turn right toward EO Kavalas Xanthis/EO2 and then left onto EO Kavalas Xanthis/EO2 (signs for Kavala). In the entrance of the city turn right onto Sappeon and then follow the roads Sappeon- Astiggos- Sappeon- Gallikis Dimokratias- Omonias- Dragoumi. Turn right to El. Venizelou where at the number 27 you’ll find Galaxy Hotel. There are many routes from and towards Kavala: Thessaloniki, Athens, Alexandroupolis, Serres, Komotini, Drama, Ksanthi, Phillipoi and other seaside places near Kavala. Ιntercity buses terminal is just 2 minutes walk (300 meters) from our hotel following the streets (from hotel heading to terminal) : Erithrou Stavrou, Averof, Filikis Eterias and at the cross with Mitropolitou Chrisostomou you’ll see the terminal station street. The airport of Kavala “Megas Alexandros” is located at Chrisoupoli about 30 km from the city. There are all year routes from/to Athens and during the summer season there are many seasonal and charter connections with many cities of Europe. From the airport you can reach the city by the regular basis routes of the public bus (KTEL Kavala). The taxi fare from the airport to Kavala is approx. 35€. If you choose a car for your transport to the city follow the signs to “Egnatia Odos” (E90/A2) to Kavala. After the airport turn left to the main road and at the end of it right and then you enter Egnatia Odos motorway towards Kavala. Take the exit EO2, signed “Kavala East”. Turn right toward EO Kavalas Xanthis/EO2 and then left onto EO Kavalas Xanthis/EO2 (signs for Kavala). In the entrance of the city turn right onto Sappeon and then follow the roads Sappeon- Astiggos- Sappeon- Gallikis Dimokratias- Omonias- Dragoumi and then turn right to El. Venizelou where at the number 27 you’ll find Galaxy Hotel.